12 x 20kg Bags of Fibre-Beet To Be Won! Fibre-Beet is a formulated blend containing all the benefits of Speedi-Beet with added high quality alfalfa for optimum condition, and quality protein for muscle tone and function. Offering an excellent source of highly digestible fibre in a soaked form, Fibre-Beet is excellent in aiding rapid rehydration and provides slow release energy without the ‘fizz’. It also has a low sugar and starch content. Fibre-Beet also has added biotin for hoof quality and can be soaked and ready to feed in only 45 minutes in cold water, or just 15 minutes in warm/hot water. It can also be used as a forage replacer (up to 60% of the daily forage allowance) when turnout is limited. Fibre-Beet has been awarded the Gastric Ulcer Feed Assurance Mark by the British Equestrian Trade Association and is the first and only soaking mash product to be approved, making it suitable for horses and ponies prone to equine gastric ulcer syndrome (EGUS). For more information on Fibre-Beet contact British Horse Feeds on 01765 680300 or visit www.britishhorsefeeds.com. 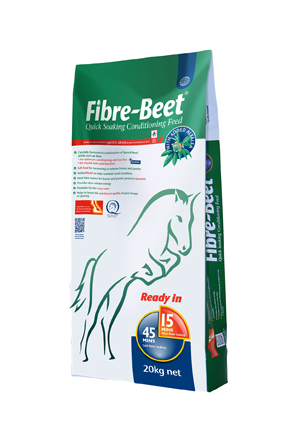 British Horse Feeds are kindly giving away a bag of Fibre Beet to twelve lucky Equitrader readers!